This adorable Novelty mouse cover fits standard computer mice and many others. For Scroll Wheels the slit on the tail end can be lengthened to accomodate your scroll wheel or cut an appropriate slit above to fit. 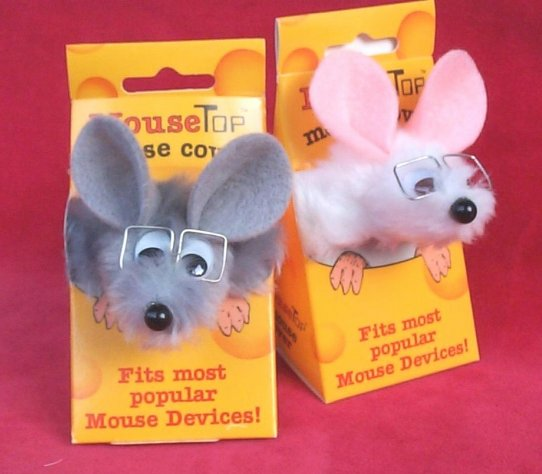 Fuzzy white or gray mouse with googly eyes and granny glasses** is boxed in its own wedge of cheese. In fact the box is so cute you may just want to leave him in the box and perch him on top of your monitor. **(Please note the shape of the glasses may vary from picture). NOW AVAILABLE - Economy Mousecovers. 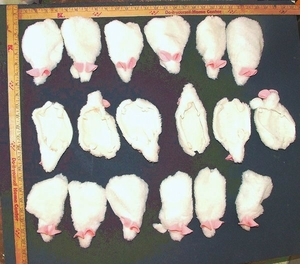 The same adorable mousecovers but without the box and spectacles. Order below. Cat Toys Bargain Lot - FUNdraiser Idea! - Only .18 ea.